A flavoring agent. It is a yellow liquid with a harsh, flowery odor. It is soluble in most fixed oils and mineral oil, and insoluble in glycerin and propylene glycol. It is obtained by distillation of flowers of Cananga odorato Hook and Thomas (tree of the Anonaceae family). 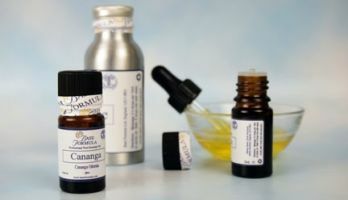 Don’t confuse cananga oil with ylang ylang oil (oil from Canangium odorata genuina). It is also used to control heart palpitations as well as anxiety. The oil of the Cananga odorata plant is often recommended for healthy skin and hair and is used in many beauty products. When used on the hair, it can help repair damaged hair or split ends. It is often used on dry skin, as it is an effective moisturizing agent, and it can also function as a way to balance out the skin’s moisture. It is often used in soaps and bath oils, and is an especially popular scent in perfumes.